“But nothing disturbs the feeling of specialness like the presence of other human beings feeling identically special.” – page 444. 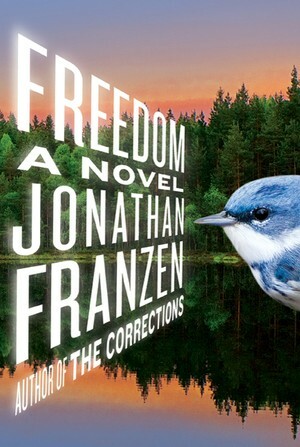 Jonathan Franzen’s Freedom is an epic piece of self-loathing. I didn’t read Franzen’s Corrections – the literary cause-de-celebre from a few years back that shot Franzen’s name as a contemporary literary titan into the stratosphere — ahhh…the power of Oprah. When it comes to writers like Franzen, I like to come in through the side door, read their follow-ups first and introduce myself to them when they are perhaps not at their best. In Freedom, Franzen introduces us to the Berglunds – the on-the-surface, perfect, Mid-West, All-American, upper-middle-class family living the dream. It comes as no surprise that they are anything but, and Franzen paints an epic anti-Norman Rockwell portrait of this family from the parents’ teenage days to their children growing up and flying the coop. Amidst this sprawling tale of middle class entitlements and aspirations run amuck, we are subjected to every stereotypical character known to bourgeois society: the tortured housewife, the middle-aged husband striving to live by the ideals he formulated in college and who still thinks he can heal the world, the spoiled children, the low-class neighbors, the anti-establishment musician and family friend, the secretly lesbian drug-addled college roommate, the flighty off-Broadway bound aunt whose best friends are cats and gays…the list goes on and on. You quickly realize that Franzen either must know an awful lot of people like this or grew up in a family like this. Hell, maybe he is a person like this. Whatever the case is, it’s clear he hates them. There are times when you think Franzen might be spinning some of the clichés on their head. Some of the chapters early on told as entries from a book Patty Berglund (the tortured housewife) is writing about herself (as a form of therapy) detailing her high-school and college days actually make you feel a little something for her character. Her trageo-comic upbringing as the only athletics-inclined child in an over-achieving academic New York Jewish family is as entertaining as it is sad, and it’s her character more than anyone else that you feel like you are on the verge of truly knowing. Unfortunately, in later chapters, Franzen murders whatever good-will you may have built up towards Patty by depicting her as a vapid, shrill, shell of a woman. Then there’s her husband Walter — an achingly well-intentioned guy who foolishly believes in the “goodness” of those he loves. You feel like he should be the most likable of the lot. He eventually gets caught up in some corporate land-grab guised as environmental conservation while his wife has an affair with his best friend and he falls in love with his all too eager and idealistic assistant. As he continues to make the same mistakes over and over it becomes hard to feel sorry for a guy who never really grows a backbone. Then there’s Patty and Walter’s son, Joey, an uber-smart, rebellious and entrepreneurial brat who coasts by on his good looks and innate abilities to enter “womanland” as a confidant. He’s presented as a little douche-bag, but when we finally reach his point of view, he turns out to be painfully emo – having truly been in love with his f***-buddy neighbor girl all these years and really just wanting to be accepted by his dad and loved unconditionally by his mom. But Franzen has him doing such deplorable things, the forced upon emotion he displays just makes him more of a snot-nosed ne’er-do-well. Franzen spends so much time with these people, psychoanalyzing their inner-most thoughts and describing ad-nauseum every physical attribute as they grow and age and become meaner and uglier to each other, that we never really get to know them. Franzen is too busy judging them, and where this is most evident is in his too-carefully constructed dialogue. As the novel progresses, we read page after page of characters fighting with each other and spewing out social commentary, which admittedly has some bite and is at times darkly humorous. The characters in Freedom don’t talk and argue like real people, they talk and argue like characters from a movie. They are Lester and Carolyn Burnham from American Beauty or every over-educated natterer from the laziest Woody Allen films. After about 300 pages of this, the characters all become interchangeable, and it’s obvious that they share one voice: Franzen’s. Franzen has a grand mastery of language, and he’s snarky enough to subvert his intentions. He also knows his audience – people like the Berglunds, people aspiring to be like the Berglunds, or critics of people like the Berglunds. He throws in big fancy words that make us feel smart because either through context or actual knowing, we understand clearly what’s he saying. His depiction of the recent Iraq War as a get-rich quick scheme is one his audience can wink at. We know what’s up. We’re part of his secret little entitled world of “in the know”. We’re special. A more detached narration with less psychoanalysis would’ve benefited the novel greatly and probably gut close to 200 of the novel’s burdensome 576 pages. A more pointedly satirical look with less false-starts towards something superficially humanistic would’ve given Franzen’s bark more bite. In the last 100 pages Franzen tries to convince us he’s really not such a bad guy and buys his characters some redemption in the form of Patty’s own words (in the apparent completion of her autobiography) and an all-too-happy-ending for Walter. Sadly it all feels a little bit hollow and put-on, and the running motif of people as migratory birds (or the murderous house cats who feast on them) never really takes flight. Freedom is the literary equivalent of Ang Lee’s film The Ice Storm. It’s aesthetically beautiful and technically well-crafted, brimming beneath the surface with guilt and anger, but it’s cold as hell. Be careful not to choke on the ice. This entry was posted in Book Reviews, Books, Literature, Politics, Pop Culture, Psychology and tagged American Beauty, Bourgeois, Bourgeois Guilt, Contemporary Novelists, Freedom, Joey Berglund, Jonathan Franzen, Novels, Patty Berglund, Psychoanalysis, Satire, Social Commentary, The Berglunds, The Corrections, The Ice Storm, Upper Middle Class, Walter Berglund. I should have proofed my comment better! It should read….”every review I read of his latest has pushed me farther away from ever reading them. He’s written a memoir….” Geez. Totally different meaning. Yeah, being a New Yorker, from upstate NY, living in Minnesota is interesting. It didn’t bother me what was said about metro New Yorkers, which is what they meant, because I recall they were just as hard on the Coen brothers for “Fargo.” And the Coens grew up here! I think “A Simple Man” got mixed reviews here, too — it came and went like a mosquito in a dark bedroom….